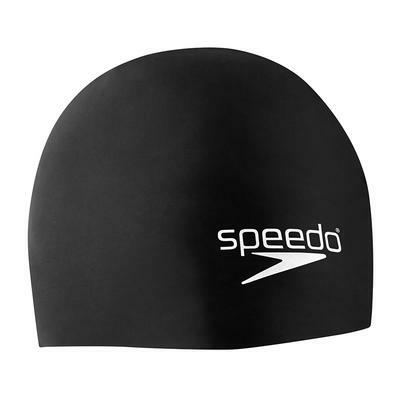 Save your hair and increase your speed while swimming laps in the pool with a Speedo swim cap. These silicone caps with elastomeric fit are comfortable to wear and increase your hydrodynamic profile. The micro grid texture on the inside of the swim cap keeps it in place without snagging or pulling hair while the relaxed fit of the Speedo Moving Tides Cap reduces the likelihood of headaches caused my pressure, letting you swim longer and get more results. 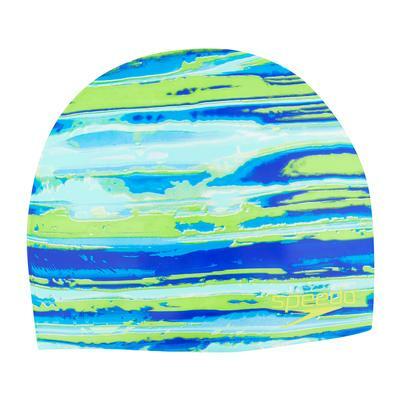 The Speedo Elastomeric Solid Cap has a snugger fit which is ideal for competitive swimming. The contoured shape reduces drag and the soft, durable silicone is quality that you can wear swim meet after swim meet. Although they may not keep your hair 100% dry, a Speedo swim cap will protect your locks from damage caused by swimming pool chlorine. Choose your favorite color and dive in!